“The young, lithe body will tell us one story, but the mature, experienced and ‘lived- in’ body will tell us another – a rich and profound tale, deep and full.” – Caroline Lamb. Footfalls is a brand new dance/art film from Striking Attitudes. It celebrates the older dancer, involving both professional dancers (aged 46-63) and a ‘chorus’ of community dancers (aged 50 to 93) from various regional groups around Wales. Footfalls is exciting because it’s about courage, it’s about uncertainty, it’s about daring. Every one of its dancers, both professional and community, has made the choice to keep dancing when many of their contemporaries have, by this stage, chosen to give up and take other paths. “As a choreographer it is a joy to work with the older performer, as they have a wealth of experience and physical knowledge to draw from and there is a depth to their performance that is generally not to be found in the younger performer. Each dancer offers a unique palette of skills and a developed and assured personality that gives their work a particular colour and flavour. It informs the choreography and gives each movement meaning and adds a further layer to it. Footfalls tells of the paths we choose as we journey through life, of our struggle with the elemental forces of the natural world and with our own internal passions, of our fear of the dangers of this earth and our delight in its extraordinary beauty. We are mortal, earthly beings, fragile flesh challenged by the vastness of the universe and our insignificant place within it. As travellers through this world, our existence on earth is but a brief breath in the life of a planet that has survived for aeons. We travel into the unknown. Sometimes the path ahead is hard, the journey so treacherous we fail and fall along the way. Sometimes the road is smooth and full of delights and sometimes we must part at the crossroads. 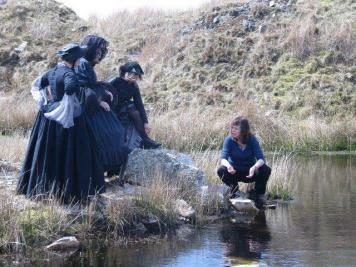 Filming of Footfalls took a year – on and off – to capture all the seasons. As a Wales-wide project, Footfalls also features mature community dancers (aged 50 – 93) from a number of regional dance groups including Cofio in Rhondda Cynon Taff, Dawns i Bawb in Caernarfon, Tan Dance in Swansea, Rhuddem in Ceredigion and Striking Attitudes Community Dancers in Cardiff.